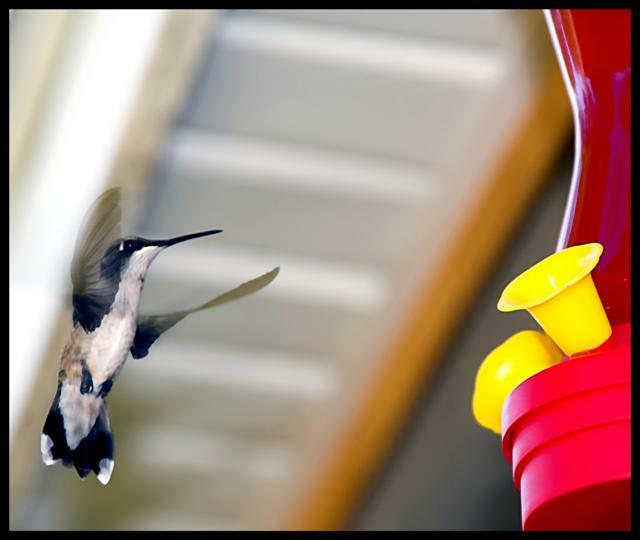 You didn't get complete stopped motion because there is blur on the front wing of the hummingbird. I read in a magazine if you use a flash when attempting to stop the rapid motion of a hummingbird, you get better results but it scares the bird off! Wow, that front wing is moving so fast it's almost translucent. This is a nice capture overall. You've stopped the motion pretty well. Could be a bit sharper as the two main subject items seem a little soft. The DOF works well to take out the background. Hope this does well for you. Good luck. above avg, but could be a bit sharper. Proudly hosted by Sargasso Networks. Current Server Time: 04/20/2019 02:43:32 PM EDT.